where is the density of central chi-squared r.v. . Also note that is the pmf of Poisson r.v. . Thus, the noncentral chi-squared distribution has a mixture representation (2.2). Note that if (not ), then the two representations in (i) and (ii) are equivalent. There should be a typo in (b). This can be verified by simulation. The figure below compared the algorithms defined by (i) and (ii), and the rchisq function in R. samples were generated for each algorithm. The degree-of-freedom was fixed as 2. 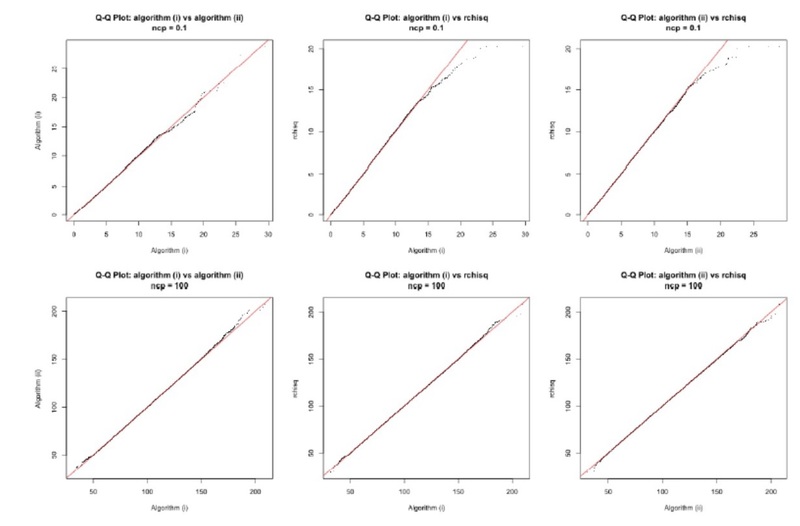 The algorithms were compared with small (0.1) and large (100) non-central parameters (ncp). The algorithms based on representation (i) and (ii) performed differently in the tail. Both algorithm were more closer to rchisq for larger ncp. When ncp is small, both algorithms departed from rchisq in the tail. #rep (ii): sum of two chi-squared r.v.